GOVERNMENT will assist businesses in Bulawayo to restock following widespread looting and destruction of shops during last week's violent protests, the Minister of Industry and Commerce, Nqobizitha Mangaliso Ndlovu, has said. 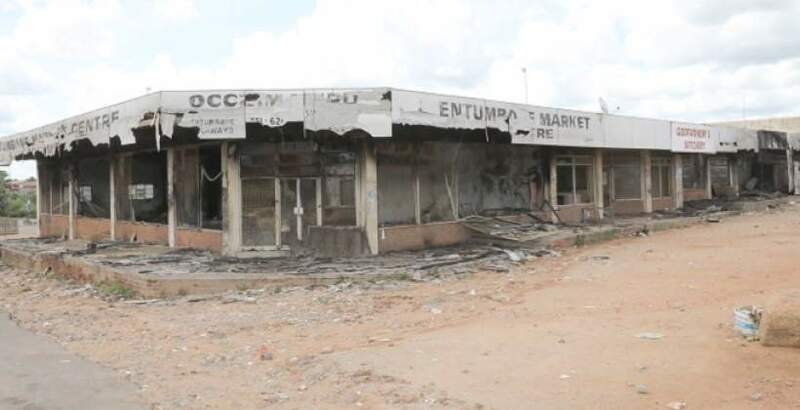 Speaking during a tour of shops looted and burnt down by hooligans in the city's western suburbs yesterday, Minister Ndlovu said Government is working on modalities to assist affected businesses to restock. "It was good to appreciate and have a physical feel of what businesses went through and seeing how communities are struggling to buy basic commodities such as mealie-meal, sugar, bread and so forth after the lootings which emanated from violent protests. As Government we are now trying to come up with ways of assisting businesses to restock and we also want to assure our people that as from tomorrow (today), supplies will begin to normalise," he said. Minister Ndlovu said he would consult his principals and discuss the modalities of addressing the situation. "It was important for me to come and see the situation after which I will discuss with my principals. I wish to encourage the people of Bulawayo that it's time for the city to show its courage and let us not be defined by cowards who are destroying our infrastructure. The character of Bulawayo will be seen by how we pick ourselves after this. We will be appealing to communities to come together. Brick by brick we shall try to rebuild our city," he said. The Minister, who was accompanied by his deputy, Raj Modi as well as Bulawayo Provincial Affairs Minister Judith Ncube, Grain Millers Association of Zimbabwe chairperson Tafadzwa Musarara, Zanu-PF Bulawayo provincial leaders and church representatives, expressed shock at the extent of the destruction and looting. He condemned the acts of vandalism and urged police to intensify investigations. He expressed concern over the pricing system by shops and urged businesses to be sensitive to the plight of consumers. The Minister however, said the destruction of property and looting was not a solution to problems facing the country. "We have been quite clear that we are concerned about the level of pricing and manner in which business people are pricing their products, but overall the response to that is not to destroy property and there is no excuse for what happened. We are putting mechanisms, working together with the business community to come up with a verified cost structure where they can also tap into that kind of knowledge of pricing their products," he said. Ncube, the Provincial Affairs Minister, urged Bulawayo residents to safeguard the city's property. "We need to put our hands together and safeguard our properties in Bulawayo. Right now as we speak most western suburbs no longer have service centres because of what happened last week and this calls for concerted efforts from everyone to ensure that this does not happen again," she said. Some of the business people who spoke to The Chronicle said they are struggling to cope in the aftermath of the looting. Mr Hendrick Boshoff who owns Bulateke Milling Company in Kelvin North industrial area said he lost goods valued at $100 000 to looters. "They broke into my premises while I was on a business trip in Mozambique and went away with beef equivalent to six full carcasses, 40 tonnes of mealie-meal, generators, compressors and laptops among other items," he said. Ms Sothini Dube who operates SD Supermarket in Luveve said: "I lost everything that was in stock and am virtually grounded. Right now I am now selling wares from my car because the shelves were destroyed and it will take time for me to recover financially." Ms Plaxedes Nyoni, a manager at Cover Supermarket in Pumula East, said the mob broke into their shop and looted fridges and groceries worth about $50 000. Ms Cynthia Ngwenya who operated a small grocery shop in the same suburb said she had been emotionally drained after losing all her items in stock. "I am one of the female entrepreneurs who had just found my feet, but sadly people came to my small shop and looted everything. I am now selling from the shop veranda because the shop was vandalised and it requires lots of money to repair the damages," she said. Hooligans, mostly marauding youths, barricaded streets using drums, trolleys, burning tyres and stones during a three-day nationwide stay away called by the Zimbabwe Congress of Trade Unions (ZCTU) and other civil society organisations aligned to the opposition MDC Alliance last week.